Making lighter versions of yummy homestyle favorites is what we do, and the time has come for us to take on classic chicken soup with rice! HG tip: Reach for soup as a satisfying midday snack. This big-batch recipe will have you covered for days! Place chicken in a large pot. Add all remaining ingredients except cauliflower. Gently stir. Bring to a boil. Once boiling, reduce to a simmer. Stirring occasionally, cook for 6 minutes. Add riced cauliflower. Continue to cook and stir occasionally until veggies have softened and chicken is fully cooked, about 6 more minutes. Remove and discard bay leaves. Transfer chicken to a large bowl, and shred with two forks. Return chicken to the pot, and mix well. It’s the “Jump-Start Your Diet Episode” of Hungry Girl: Chew the Right Thing! Click to listen, and subscribe so you don’t miss an episode. We’ve got fun things in store for 2019! 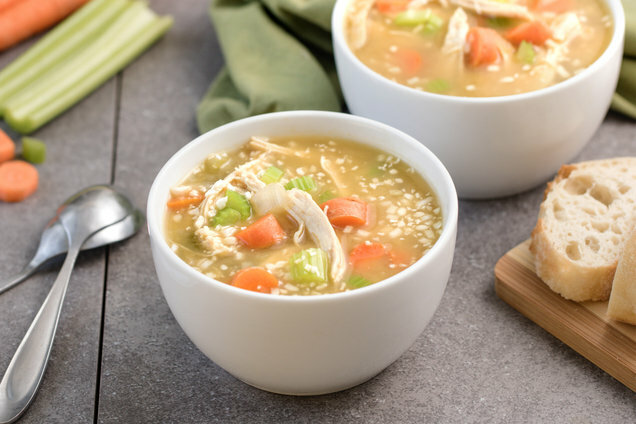 Hungry for More Healthy Chicken Soup Recipes? It’s Day 8 of our Happy Chew Year Challenge! Today’s to-do: Try out a veggie-based swap for a starchy carb… Here’s a slew of recipe ideas! Pass the virtual ladle… Click "Send to a Friend” to share today’s soup recipes! We may have received free samples of food, which in no way influences whether these products are reviewed favorably, unfavorably, mentioned with indifference, or mentioned at all. Click for more about our w88 pokereditorial and advertising policies.